Tolo News: Speaking at a press conference at the Presidential Palace. 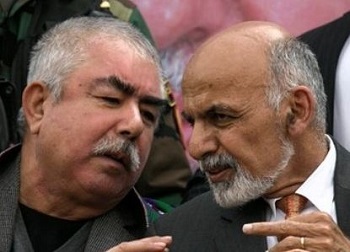 Ghani said: “General Dostum’s return is very possible. This issue has a legal aspect and the general attorney will investigate it.” Ghani also said that illegal armed men are becoming a problem in the country. “Operations against illegal arm forces are being carried out at the request of the people,” Ghani said. This come after the defense ministry said on Saturday that preliminary findings by the investigation team into the assault of Nizamuddin Qaisari’s bodyguards, about 12 days ago, shows that Commandos from the Afghan Special Forces Unit in Faryab were not involved in the incident. Click here to read more (external link).